Still using xtgem subdomain on your xtgem site? Well, xtgem provide a lot (+10) subdomains users can register. But if you want your xtgem site to looks more proffesional, you may want to consider using a custom paid domain instead on your xtgem site. Xtgem allow us to park up to 3 different domains on one site. So, you can make your xtgem site be accessed through 3 different domain names. Or, the three domain park quota can also can be used for each of your xtgem site subdirectories e.g. blog.domain.com for your xtgem site directories which contains blog module, and shop.domain.com for your xtgem site directories where user can make transaction (the tutorial are following in the next post!). All right now that you have purchased your own top level domain domain but don't know how to setup it on your xtgem site? Follow these easy steps below. Login to your domain provider and enter the domain configuration page to manage the nameservers. Change the nameserver setting to "use custom nameservers". Then fill the nameservers input with "NS1.XTGEM.COM" and "NS2.XTGEM.COM". This change could take up to 24 hour to be effective but it's also possible the changes would be instant. Now if your visit your custom domain address and it is redirecting you to xtgem homepage, it means the nameservers changes are successful. Next step we just need to enter our custom domain address in our xtgem site setting. 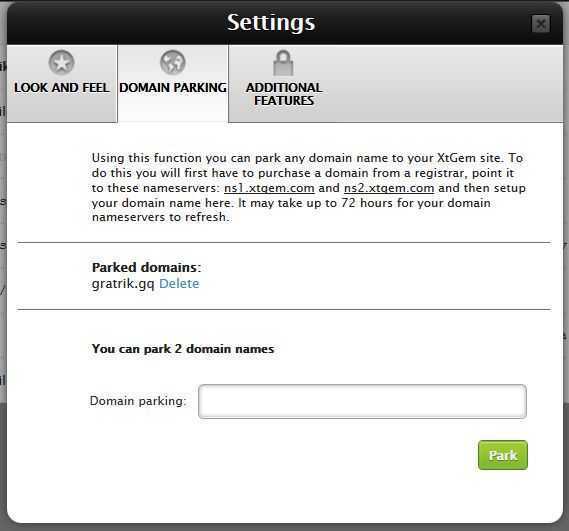 Login to your xtgem site, then choose "SETTINGS" -> "DOMAIN PARKING". Enter your custom domain address WITHOUT "www", the click "Park" to finish the domain parking process. Login to your xtgem site, then click "Settings" (in the upper right corner) -> "Domain Parking". Enter your custom domain address WITHOUT "www", the click "Park" to finish the domain parking process. Finally, access your parked custom domain address to visit your xtgem site! Comments (0) in "Setting Up Custom Domain on Xtgem Site"